Begun in the United Kingdom in the 1980s, the “Shabby Chic” design theme involves much use of distressed-look furniture and seemingly mismatching colors and vintage patterns, as if found items were paired together out of simple necessity. The “Shabby Chic”/Bohemian principle also extends to the garden where anything with roses in the design is valued. If you are planning a Bohemian-themed wedding reception, what better way to provide the finishing touches than with these “Floral Garden Collection” wedding favors. The line features distressed wood and vintage Kraft-paper and nostalgic chalkboard backgrounds with designs featuring rustic arrows, woodland wreaths, single posies and floral bouquets highlighted by timeless roses. Choose from a wide variety of personalized party favors including: mint tins, notebooks, candy jars, playing cards, seed packets, personalized goody bags, mason jars large and small, gable boxes, personalized miniature milk bottles, match boxes, party cups, candle tins and even mini sunscreen bottles. This entry was posted in Bridal Shower, Personalized Gifts, Wedding Favors. The holiday season can be overwhelming, with all the shopping and errands you need to do and all the parties you’ll be going to. If you’re stuck with a stock of mugs, pens and notepads and other giveaways that you weren’t able to “dispose of” during the previous holidays, it’s time to look for other instant favors. If you are in a rush and planning a holiday party, better get a dozen or more of these XO (shorthand for “Hugs and Kisses”) design bottle openers — adorable favors that anyone will enjoy receiving. This elegant bottle opener is made with sturdy metal with a chrome finish. The opener is artfully designed inside the letter O while the letter X serves as a handle for good grip. Each bottle opener comes packaged in a coordinating designer gift-box with a display window and XO motif in silver, finished with a white organza bow and a “For You” hanging tag. This entry was posted in Bridal Shower, Other Celebrations, Wedding Favors. Shaped to resemble a beer keg, these unique stainless-steel beer mugs make great gifts because they are useful, easy to store and will last for years and years. Each standard-sized mug can hold 14 ounces of beer or other adult beverage. 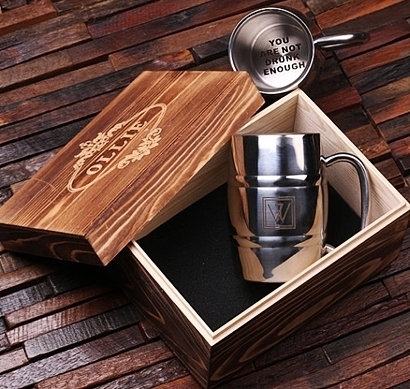 Even better, it may be personalized with your choice of 34 distinctive monogram designs and your own custom message on the inside base of the vessel. Better yet, you may deliver the mug in a personalized wooden keepsake gift-box with your choice of the pictured design or the same monogram design as on the mug! This entry was posted in Birthday, Groomsmen, Personalized Gifts, Wedding Party. Bridal season is upon us and we know that when the love months come, it’s time for hearts and more heart-shaped items, accessories and favors as the heart is the symbol of love. It also represents an important organ in our body that is responsible for our life — the beating heart. It’s a timeless symbol that is often utilized as a decorative motif during wedding celebrations. These cute acrylic heart-shaped favor containers will be perfect for your wedding. Using sticker labels, each small container may be personalized with your choice of dozens of fun designs and the color of your choice depending on your theme and motif. 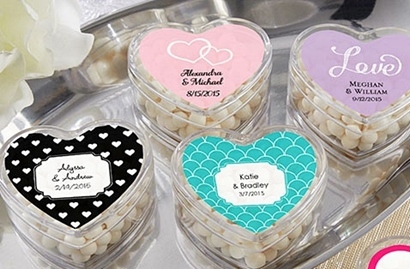 You may fill these heart containers with mints or other sweets for your guests to take home wedding favors filled with love. This entry was posted in Personalized Gifts, Wedding Favors. Creating personalized gifts and take-home favors for your wedding guests can also be an enjoyable part of the wedding preparation. You know you’ll have a wide selection of items when choosing your own favors and giveaways. Candies, chocolates and other sweet treats are common favors. If you’re not giving edible favors, be sure to give useful items that are worthwhile for your guests to keep. Choose practical and functional favors like kitchen and travel items for favors that will remind your guests of the happy time they had during your wedding celebration. The packaging of your party favors is equally important. Choose recyclable materials like boxes that are made from paper carton. These mini gable-shaped favor boxes are also suitable for holding small trinkets like coasters, bottle openers, keychains, hand soaps and many more. 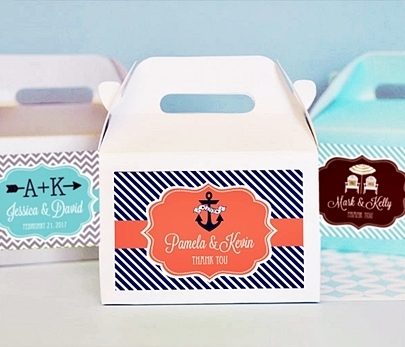 These “Choose Your Theme” mini gable boxes may be personalized with stickers with your choice of dozens of designs and a wide variety of pattern and color combinations to match any event’s theme. The boxes are available in your choice of six (6) colors in sets of 12. The scenery of a wedding location is important especially if you are planning and preparing for a destination wedding. An outdoor garden is a common location for weddings while a seaside setting is also preferred by couples who want to celebrate the most important day of their lives in an extraordinary location where they can enjoy the company of their guests. Planning for a beach wedding can be very exciting as you’ll have many choices and options for your designs, decorations and favors. Combine traditional wedding elements with seashells, colored sand, beach balls, colorful bouquets and more. You may also decorate the ceremony area with starfish and raffia, feature nautical-inspired centerpieces on every table and write table placecards on sand dollars. 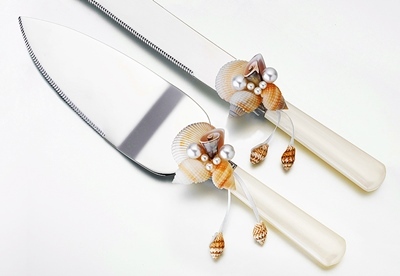 To complete the accessories for your ideal beach wedding reception, choose this Lilian Rose stainless steel cake knife and server set adorned with seashells and pearls. This set would be perfect for the cake cutting ceremony during your seaside resort wedding reception. This entry was posted in Wedding Accessories, Wedding Reception. At the start of the year, we usually receive personalized planners and calendars as gifts from friends, work colleagues and business clients. Those colorful calendars and table planners are always useful and would always find a place in your office. But if you want to do the giving for a change, consider one of these unique personalized wooden wine barrel signs. 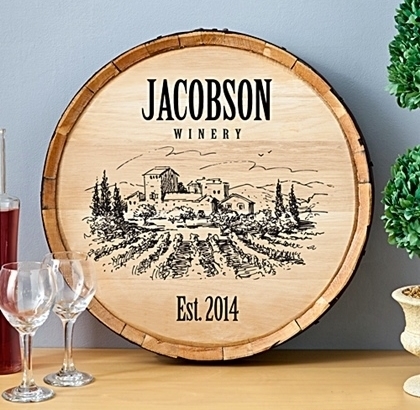 These unique personalize signs are made from real wooden Oak barrels. Any of the seven available designs would make a fantastic gift for newlyweds, friends or business clients who are wine enthusiasts. This entry was posted in Bridal Shower, Bridesmaids, Groomsmen, Personalized Gifts. Celebratory drinking at weddings is a timeless tradition observed worldwide. At the wedding reception, guests drink and offer toasts to the newlyweds to give recognition and honor to their union. Toasts are commonly offered by the wedding’s host or hostess. Make the toast more special for the happy couple with this set of Lillian Rose Peacock Feather Toasting Glasses. 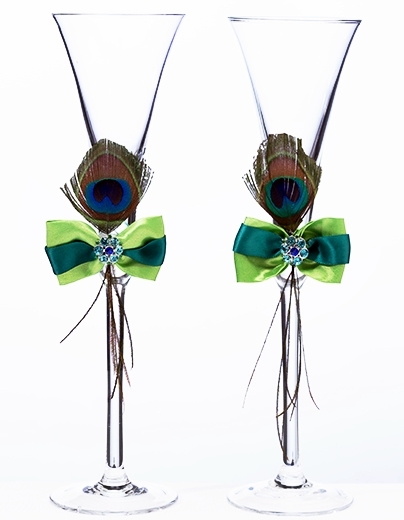 Each flute features a slim stem adorned with an aqua and green ribbon and a peacock feather in the same color scheme. A flower rhinestone ornament holds the bow together. The wedding attendants, a special guest, a close relative or a friend of the couple may offer toasts but the “host offers the first toast” rule is also observed as in other celebrations and functions. The host or the person giving the toast can get the attention of all the guests by standing and raising his glass. This entry was posted in Bridesmaids, Groomsmen, Wedding Accessories, Wedding Reception. If you are going for a personalized design for your wedding reception, choose neutral designs that will suit and complement your overall theme and motif. You can choose bright and colorful designs for a daytime or afternoon wedding and a more subtle, rustic design for evening weddings. 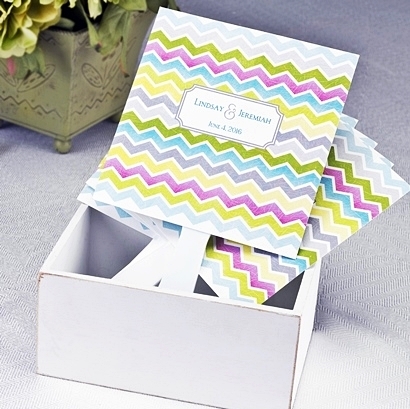 The chevron stripes design is best if you are going for a colorful, youthful theme for your wedding. We offer are many Chevron-patterned items and accessories to choose from that you can mix and match to complete your decorations and favors ensemble. If you are giving away several little favors for your guests at your spring or summer outdoor wedding reception, consider giving these Personalized Chevron Favor Fans. Each fan is made of a 5”x 5” square card with a plastic handle. Even better, each may be personalized with the couple’s first names and the event date in your choice of 29 vibrant ink colors and 14 font styles. This entry was posted in Personalized Gifts, Wedding Decorations, Wedding Favors. While just about everyone will know who the bride and groom are, and their tables are usually set apart from the guests at the wedding reception, to have these sashes across their chairs adds a unique, elegant touch to the wedding. More than that, the bride and groom may also keep these as mementoes of their special day. And if they are sentimental, they could always reuse these on their 10th, 25th or 50th anniversary celebrations. 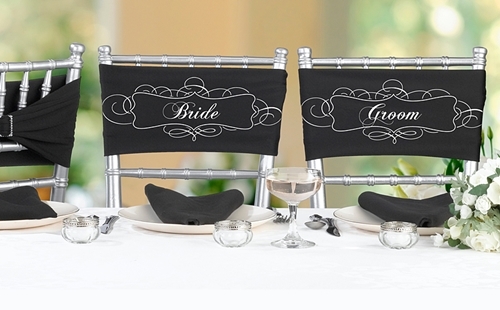 This chair sash set will work perfectly with a silver theme, as well. Black and silver themes are good choices for those with modern tastes, and there are some brides who even go for all-black wedding themes. A perfect way to complement those themes!